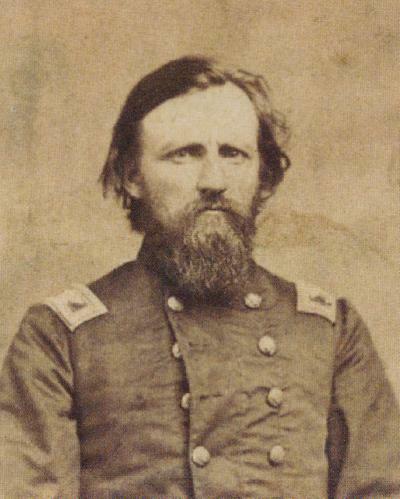 Governor Alexander Randall appointed the popular Heg, Colonel of the 15th Wisconsin Volunteers as of September 30, 1861. His first duty was recruiting, which brought this appeal: "Scandinavians! Let us understand the situation, our duty and our responsibility. Shall the future ask, where were the Scandinavians when the Fatherland was saved?" After winter training at Camp Randall, Heg led his 960-man contingent into the field. Indeed they were Norsemen — Olsen, Hanson, Peterson, Johnson, Tompson, Erickson, and no fewer than 115 who answered to the name of Ole. They marched off in companies: The St. Olaf Rifles, Scandinavian Mountaineers, Heg's Rifles, Rock River Rangers, Clausen's Guards.